In any organization, email service is one of the essential and critical services for communication. Proprietary software such as Microsoft Exchange (Outlook 360), IBM dominos and cloud email services like G Suite are ahead of race compared to opensource suits. But, one such product that is giving a good fight to them is ZCS (Zimbra Collaboration Suite). Zimbra is one of the leading mail server used by many organizations, and it comes in two versions, Open Source, and Enterprise version. 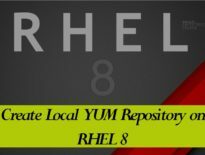 In this post, we will install Open Source Zimbra Collaboration Suite 8.8.10 on CentOS 7 / RHEL 7 & Ubuntu 16.04. 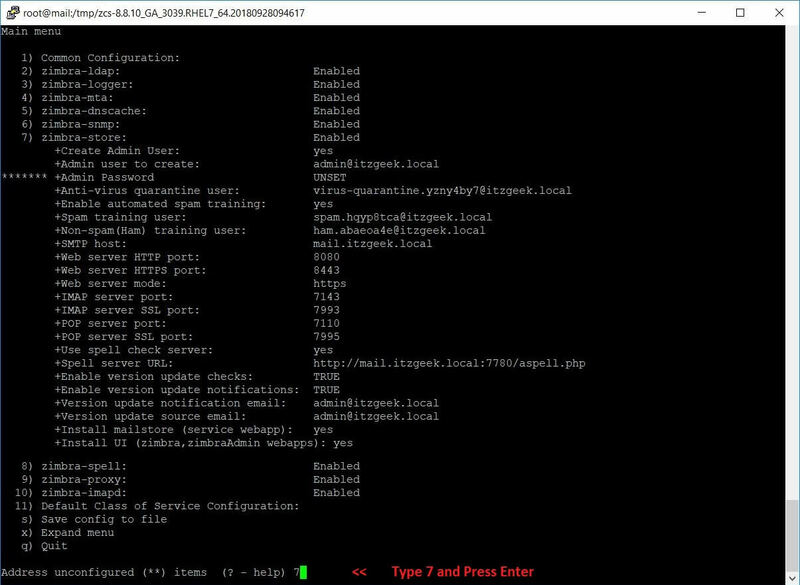 Set the hostname of your mail server. Add the following lines in the /etc/hosts file. Zimbra recommends the firewall to be disabled. 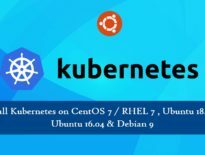 In CentOS 7, postfix is installed and running by default. So, we need to disable it for Zimbra installation. In Ubuntu 16.04, dnsmasq uses port 53 and acts as local resolver which conflicts with Zimbra DNS. So, we need to disable the use of dnsmasq. Comment out the dns=dnsmasq line by putting a hash # in front of it. 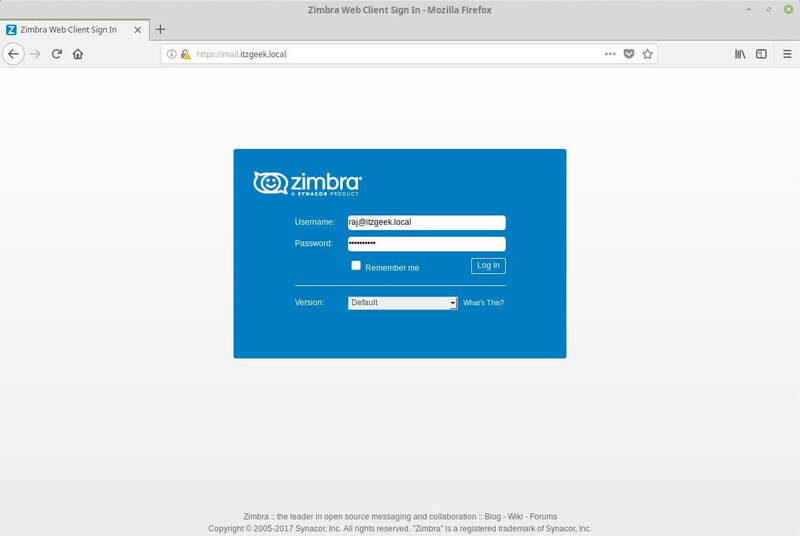 For this demo, I will configure Zimbra to receive emails for domain itzgeek.local. itzgeek.local is not a live internet domain, and it can’t receive or send emails to internet domains such as gmail.com or yahoo.com. So, I have created one more email server (blog.local) in my environment to test the functionality. 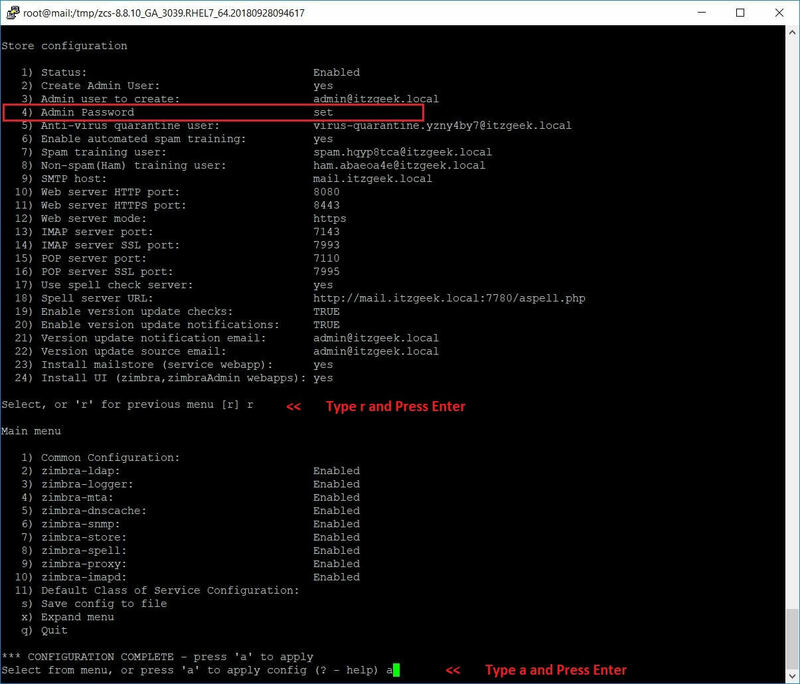 Installation for the live domain is similar to local domain setup, and it will work only if the A, MX and SPF records are created properly as shown in the next step. You would need to create A and MX record for your domain to receive emails. 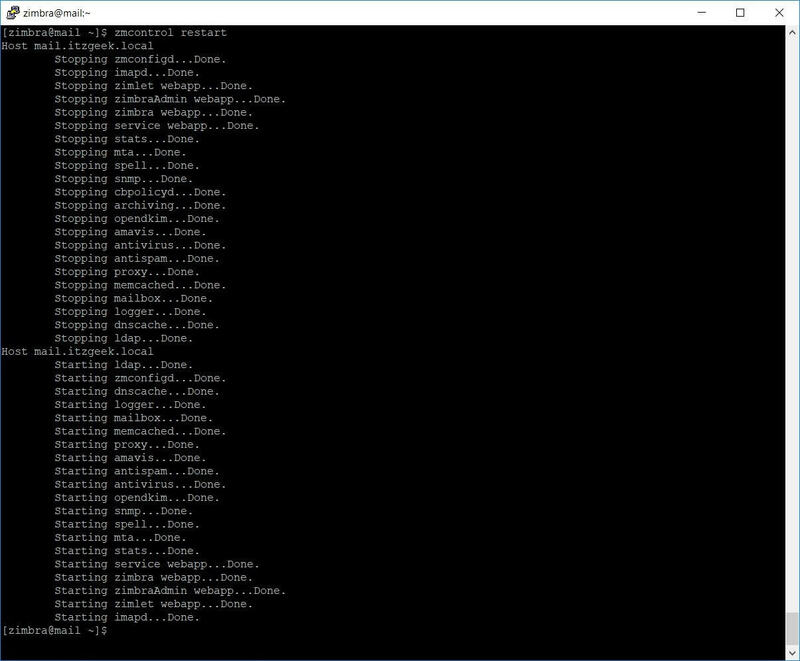 The local test domain set up is done by creating A and MX record on the local DNS server. Verify that the A is configured for your domain using dig command. itzgeek.local. 3600    IN      MX      10 mail.itzgeek.local. A record is to point your system’s FQDN (hostname) to your mail server IPv4 address. MX record is to specify which mail server is responsible for accepting email messages on behalf of your domain. SPF record is used to verify which mail servers are permitted to send email on behalf of your domain. In the example below, emails sent from all servers defined in MX record of itzgeek.com are permitted. itzgeek.com. 3600 IN TXT "v=spf1 mx mx:itzgeek.com ~all"
PTR (Pointer) is an IP address to domain name mapping, and it’s the exact opposite of A record which maps domain names to IP addresses. Most of the organizations have spam filters which will perform a reverse DNS lookup on the IP address of your email server that is sending emails to them and would block emails from your server if the PTR record is not set. If you are struggling to create DNS records, you can always reach your domain registrar for assistance. 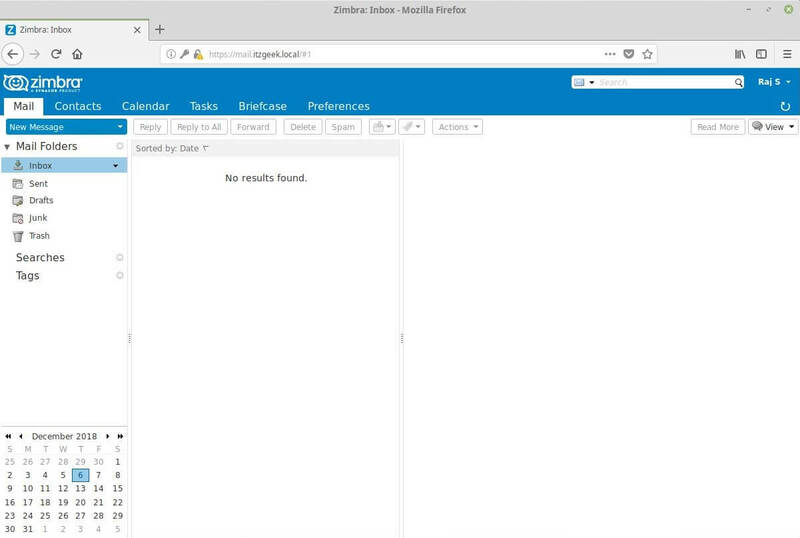 Create a directory called zimbra to place the installer. 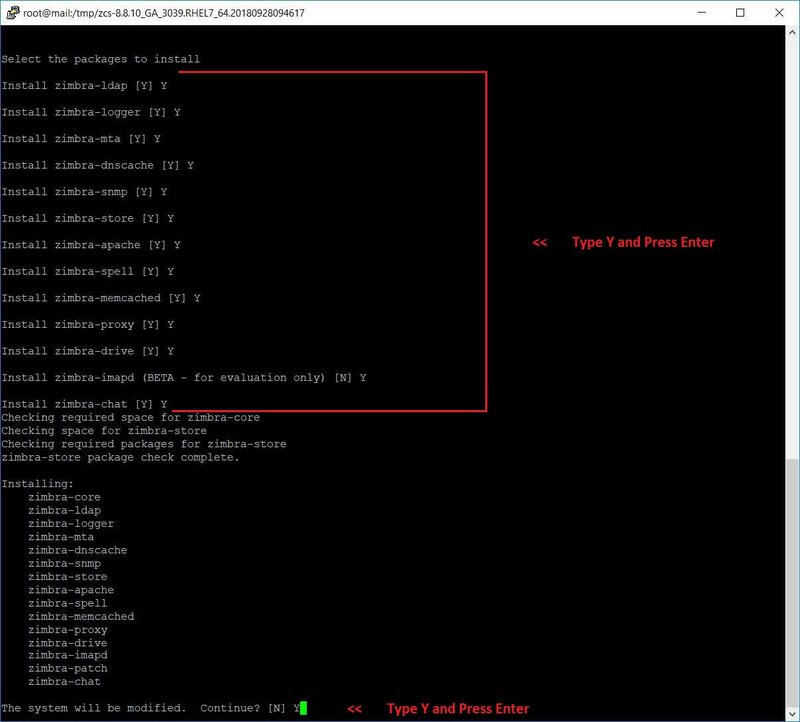 Once you execute the install script, you will get text-based installation wizard. Press Y to accept the Zimbra license agreement. Now Configure the Zimbra package repository. Press Y to all Zimbra Components to install. Also, press Y to continue to download the Zimbra related packages. This task can take time depending upon on your internet speed. Once all the Zimbra packages are download and installed, we will get the below window. Enter the domain name for Zimbra installation. In my case, it is itzgeek.local. If your installation is for the live domain, enter like domain.com or domain.org. Now we need to set the Zimbra admin password. To do that, press 7. Then, press 4 to set the Zimbra admin password. Now press r to go to the previous menu and then press a to apply the changes. Save the installation log and continue. Upon successful completion of configuration and starting the services, you will get the output something like below. 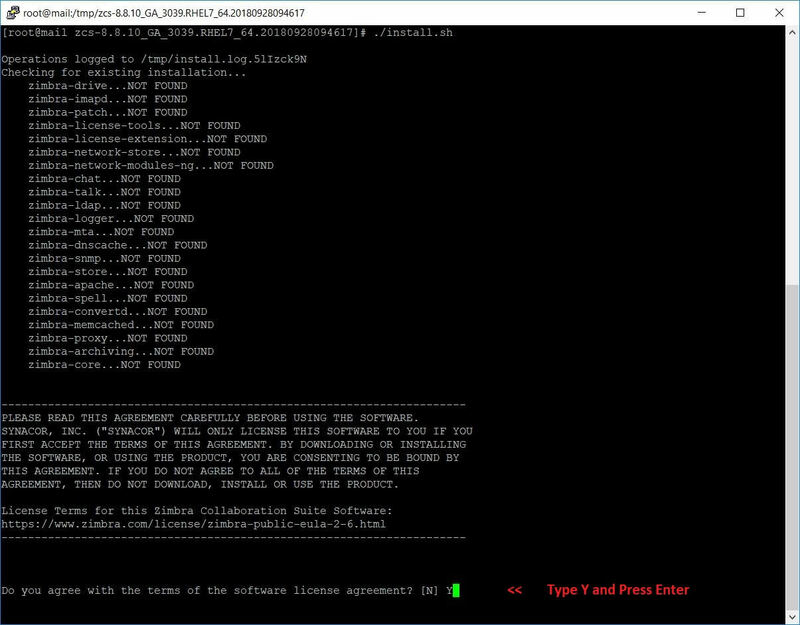 To check the Zimbra services status from the command line, you would need to switch to zimbra user. If required, you can restart the Zimbra Services using the following command. 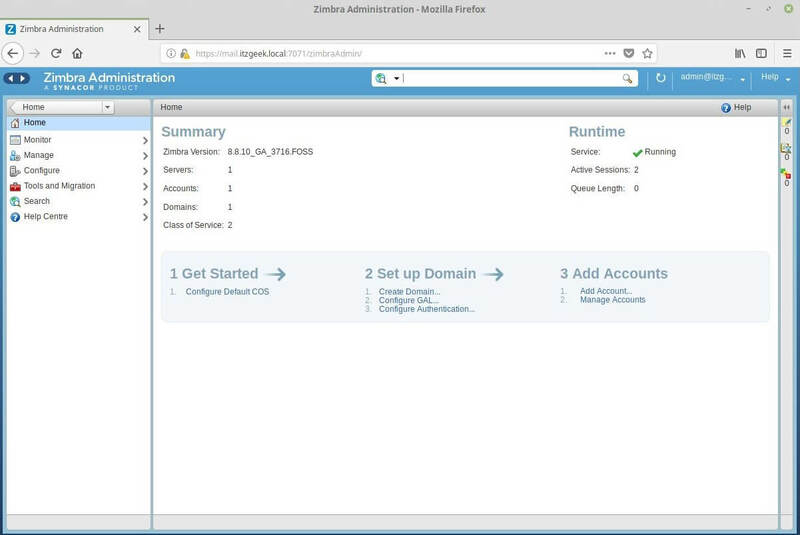 To access the Zimbra Admin Portal, type below URL in the Web Browser. 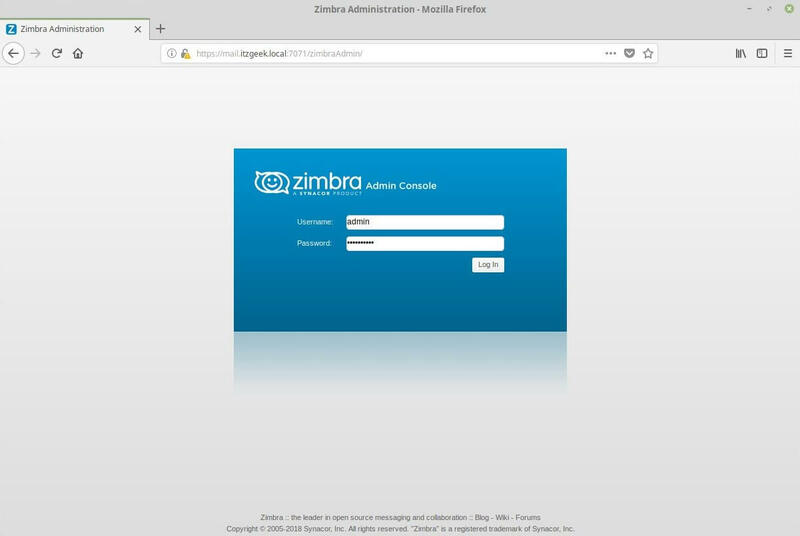 You will get the Zimbra admin login page. Login with admin and the password you entered during the installation. Upon login, you will get the dashboard where you can view the summary. To test the functionality of Zimbra, I would be creating an email account for receiving an email from second test domain blog.local. To create an email account, go to Manage >> Accounts >> New. Scroll the window down to set the password for the new email account. Then, click finish. Log in as the newly created user or as admin to see admin emails. Here, I will log in as raj@itzgeek.local. 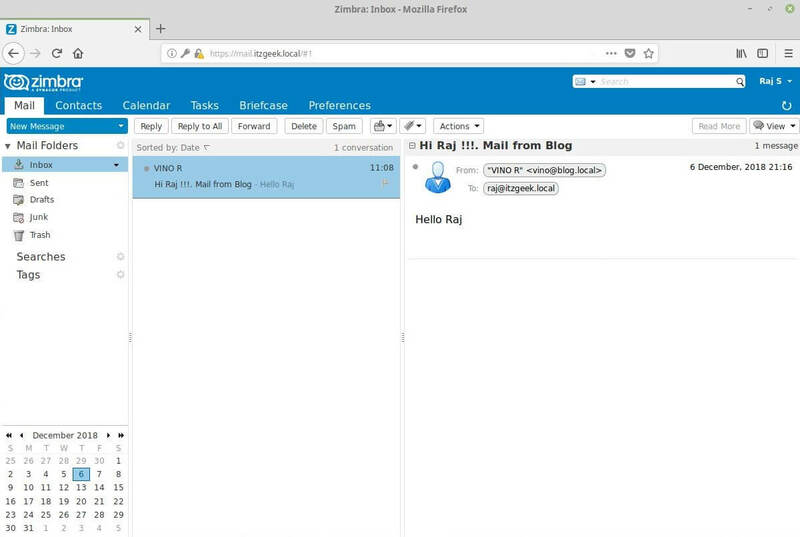 The Zimbra webmail will look like below. The below screenshot I took after I sent an email from my second domain and you can see it is from vino@blog.local. This email confirms that the Zimbra is working as expected. In any time, you want to uninstall Zimbra mail server from the system. Go to the installer directory. 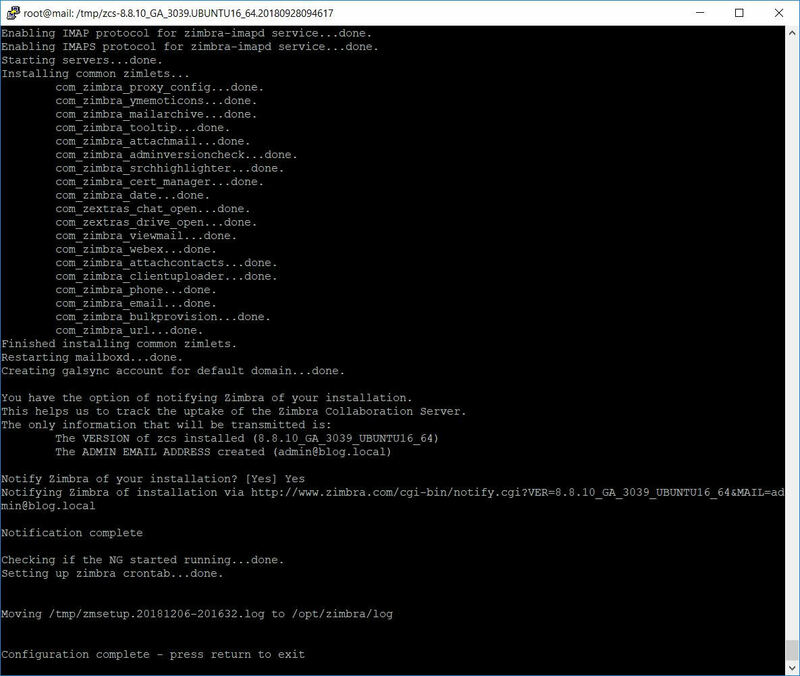 Then, run the install.sh script followed by -u.